Faith and Justice are sister and brother and are African American children who represent the best in people. They have a strong connection to the Creator, the universe, the earth, and life around them. They are dreamers, and are also very hard workers. Faith and Justice eat an alkaline plant based diet which keeps them energized, strong, happy, smart, and vibrant. They have superpowers that connect them to the earth and allow them to make plants grow strong. They are protectors of the earth. Faith and Justice are chosen to remind people of their connection to the earth and the healing power of plant foods. 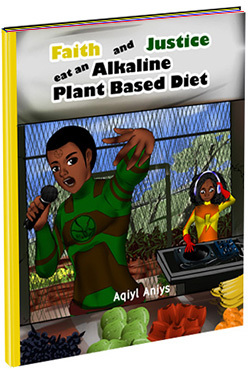 This children’s book serves to educate young children about the benefits of an alkaline plant based diet at an early age. It is difficult to break bad habits so we must do all we can to establish good eating habits in children at an early age. I have addressed the basic components and benefits of an alkaline plant based diet in a simplified but comprehensive manner that will help children and also adults gain an appreciation for eating plant foods that support their health and vitality. The book also aims to strengthen the self esteem and imagination of young children by developing Faith’s and Justice’s characters as young superheroes. They are divinely connected to the universe and the earth, and are shining examples of the best of humanity.